Quarterly Songs of Praise services are held at the Chapel with contributions from members of the Circuit. On the 4th Tuesday of each month there is a short Communion Service preceded by tea & cake and opportunity for informal chat. All as announced in local press and on the noticeboard. In November 2009, shortly after celebrating 75 years in the building, the Church Council disbanded and a final service took place. 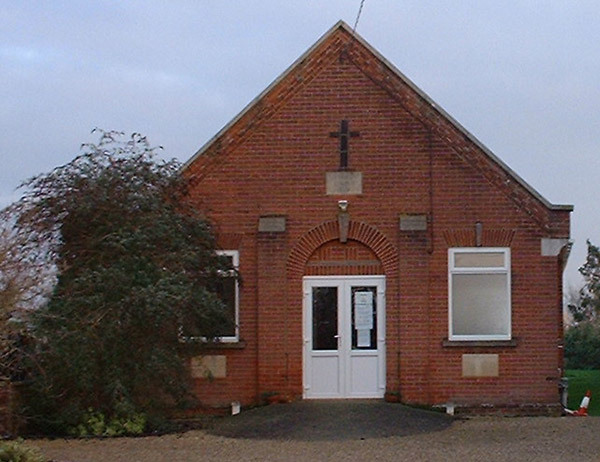 Great sadness was felt by the congregation, members of the Circuit and village residents if this was to prove to be the end of a Methodist Church presence in Fingringhoe. Fortunately, the Circuit Meeting showed great faith and agreed that no immediate decisions would be taken with regard to the premises but that attempts should be made to create a new role for Fingringhoe. A small management group was formed and Rev’d Ruth Ridge (a previous Presbyter) agreed to assume pastoral responsibility for the project. Since then exciting things have been taking place. Additional links have been formed with the local Church of England School and Rev’d Ruth Ridge took regular assemblies at the school. With the backing of the Head Teacher there have been half termly “Messy Church” type sessions at the Chapel involving up to 30 children. The format is usually – welcoming nibbles and drink, an introduction of the topic, activities around the theme (the messier the better) and a final message with song. The school have also used the Chapel for a World War II evacuation experience day, complete with air raid sirens to encourage taking refuge under tables and visits from people to share their own experiences. The Monday coffee morning, organised by a rota of local volunteers, attracts between 15 and 25 people weekly and has become a recognised meeting place for the village community. There is a monthly Saturday lunch club with transport being available. A conventional hot lunch is provided with tea\coffee and there is a regular group of between 15 and 25 people who come along to enjoy a time of friendship. Each meal concludes with a “pause for thought”. Following the closure of the Fingringhoe Village Post Office, in September 2014, an “Outreach” Post Office facility started using the Chapel in March 2015. This is open for 3 hours on each Monday & Friday morning together with Wednesday afternoons. Volunteers from the Monday coffee morning are on hand to provide tea & coffee for those who drop in to use the Post Office. the Village Drama Group for rehearsals. The chapel has also been used as a day retreat venue for the Circuit & other denominations from the Colchester area as well as privately for family occasions. This may not be a Church where many ‘standard’ services of worship are taking place, but it is certainly a Church which is serving its community by showing good Christian witness and to work out our vision for Fingringhoe Methodist Church (the Chapel). “To be a witness to God’s presence and love in the wider community of Fingringhoe and to join in this witness with fellow Christians from other denominations”.